Gareth Hughes was a Welsh actor in theater and film who worked primarily in the United States. According to historian William J. Mann, he was a "flaming little queen". Gareth was born in Llanwelly, Wales in 1897 and began acting with a Welsh Shakespeare company when still quite young, playing Desdemona. He arrived in New York in 1913 and played a series of small roles before making a break with August Stridberg's "Easter". He went on to play in "The New World" and "Salome" and became a Broadway favorite. World War I began while he was starring on the stage at the Empire Theatre, working under Charles Frohman's company. Although he was British, he filled out a Draft Registration Card on June 5, 1917 - but stated that his eyesight was defective and that he had "nervous trouble". This was a common "symptom" noted by psychologists for homosexuality, as well as other "disorders" at the time. 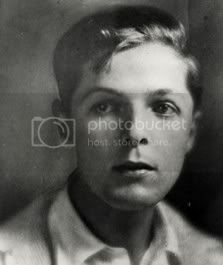 Then he met producer Ryszard Ordynski, who was bi-sexual, and asked Gareth to come to Hollywood to remake "Everyman" in 1917. Gareth agreed easily made his way into Ordynski's circles which included his lover, set designer George James Hopkins, as well as the famously eccentric Alla Nazimova. The writer Fulton Oursler called Gareth "the charm boy to end all charm boys." There seems little doubt, regardless of his angelic face, that he had a great deal of fun in the pre-code days. Actress Viola Dana told historian Anthony Slide that several actress's refused to kiss him because he was so sexually active. The big question is - active with whom? It was around 1920 the he met Florence C. Ashenfelter, a Christian Science Practitioner with offices in the Loew State Building in Hollywood. Florence would later swear to identify Gareth for his passport in 1924 - when he went on a world tour, presumably a vacation. This may have been the beginning of his religious interest in adulthood. Gareth continued working in film in Hollywood until 1929, going back to Broadway briefly in 1925 to perform in "The Dunce Boy". After 1929 he went back to the theater, but he continued to live, or at least keep a residence, in Los Angeles. He lived in several different locations around the Echo Park area of LA and lived with a number of people during the 1930s. One of these, in 1936 according to Voter Registration records, was an interior decorator named Myron L. Gray. Things changed for Gareth during World War II. Although he continued to Register to Vote in California as late as 1944, when he registered for the Draft in WWII, he gave his address as 980 Memorial Dr in Cambridge, Massachusetts. He had joined the Society of St. John, the Evangelist and had changed his name to Brother David. 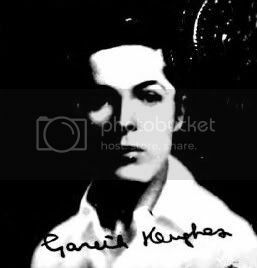 The order stationed him in Nevada by 1946 where he became known as "Dr. Gareth Hughes" as well as "Brother David". His past in the theater was not only known, it was celebrated. He toured the state that year, after the war, displaying his priceless collection of books which included a 17th Century Shakespeare Folio, a "Book of Hours", and other manuscripts dating back to the 12th century. He also performed readings of several Shakespeare plays and Celtic poems. In 1948 he accepted a position with the University of Nevada and continued to perform marriage and give last rights at funerals. Well respected and loved by the community, this period in his life could be considered his greatest work. Gareth passed away quietly at the Motion Picture Country Home and Hospital in Woodland Hills on October 1, 1965. He was 70 years old. He passed without the movie industry noticing for almost two weeks - when his obituaries were finally published on October 14. Gareth Hughes has been engaged for "The New World," one of the new playlets written by James M. Barrie, and to be produced by Charles Frohman early next month. Gareth Hughes retires from the cast of the plays at the Empire Theater in New York next week and leaves at once for Boston, where he will play Ariel in the elaborate revival of the Shakespearean masque, "Caliban," which is to be given at the Harvard stadium. Of the original members besides Mr. Hughes, Howard Kyle and Lionel Braham return to the cast. Gareth Hughes has joined the movies for a spell. He is playing the lead in a World film, "My Love Is But a Lassie," Of course, the part played by Hughes is the laddie. Hoot, mon, hoot! Gareth Hughes, after completing his engagement in Boston, where he is acting in typical hot weather costume, the part of Ariel in the revival of "Caliban," will journey to the seashore to do a Scotch story in film form. William A. Brady will direct it. Gareth Hughes, who is acting this week in Chicago where "The King of Zalames" is being presented with Leo Ditrichstein and his capable company, will enact the title role in "Everyman" when Richard Ordynsky [about five words illegible] New York. He acted the part in Los Angeles last year. Gareth Hughes returned to New York last week from Chicago, where he has been acting with Leo Ditrichstein in "The Judge of Zalamea," He is to appear shortly in a new Irish play which, it is predicted, will win popular success. Gareth Hughes who created the role of the young officer in Barrie's "The New Word" at the Empire theater earlier in the season, was unable to return to the part this week when it was revived because of his appearance in "Salome" and the group of Irish plays at the Neighborhood Playhouse. Gareth Hughes, 22, played the part of an 85-year-old fisherman when he was 14. Part of Lord Mount Severn in "East Lynna" when 15. Gareth Hughes has completed "Garments of Truth" and is ready to go ahead with a long list of pictures which have been selected for him. Among them are "Little Eva Ascends," "Barber John's Boy," "The Gay and Festive Claverhouse" and "Tommy Carteret." Gareth Hughes is not married. He says he never will be. But then, you see, he is only 22. It's just a phase of youth. STUDIO GOSSIP - Gareth Hughes plans to quit movies for the stage. LOS ANGELES, Feb. 15 - (AP) - Gareth Hughes is playing a role in the federal theatre project. He earns $94 a month. When he was a star of silent films, his weekly pay check averaged $2000. "But I haven't been as happy in years - tremendously happy," he said today. "I'm again an amateur, learning what I can. The exuberance of the men and women about me impresses me deeply. Out of this work will come the revival of many great actors, and possibly the creation of excellent new drama." From the New York stage, Hughes came to Hollywood in 1919, playing with Clara Kimball Young in "The Eyes of Youth," and winning favor as a wistful juvenile. His career reached a crisis with the advent of talkies. Specimens from a priceless collection of rare books were displayed by Dr. Gareth Hughes this week at a meeting of the Reno Poetry Workshop held at the home of Mrs. Ray J. Root. Dr. Hughes' collection, described as "first rate" by literary authorities at the University of Nevada, includes an original Fourth Folio edition of Shakespeare dating back to the seventeenth century, a Quarto Edition of Shakespeare and a great many other early and rare editions. Workshop members had the pleasure of examining a Fourteenth Century breviary written on vellum and bound in velvet and wood. Illustrations of the work are done in gold and lapis, and colors of the illuminations are described as clear and fresh. Dr. Hughes explained the use of the breviary entitled the "Book of Hours," stating it was employed by wealthy families of the period for their private prayer services. Dr. Hughes' collection also includes manuscripts from the Sixteenth, Seventeenth and Eighteenth centuries, it was stated. At present pastor of the Union church at Wadsworth, Dr. Hughes is a former Shakespearian actor with experience both on the legitimate stage and in the early films. He presented several interpretations of Shakespearian characters before the Workshop, including his version of Shylock and scenes from Richard the Second, which were enthusiastically received. For a closing entertainment, he read Celtic and Gaelic poetry from a collection of songs, poems and chants by Fiona MacCloud, entitled "The Hills of Dreams". His delivery of the poems was described as inspirational in meaning and beauty. At the close of the evening, refreshments were served by the hostesses, Mesdames Ray Root and Galen DeLongchcamps. Those present were Mesdames Galen DeLongchamps, Ted McGowan, James Mullen, Harry Bruce, F. A. Denton, Ray Root; Messrs. Harry Bruce, Galen DeLongchamps, James R. Daugherty and Dr. Gareth Hughes. Dr. Gareth Hughes of Wadsworth, who has a priceless collection of manuscripts dating back to the 13th century, was the interesting speaker before the members of the Literary Club of the University of Nevada during the week. He had a number of his manuscripts on display. Dr. Hughes, former Shakespearean actor also gave two readings from "The Merchant of Venice" and "Richard, the First"
Gareth Hughes, former star of the theater and screen, who now resides in Wadsworth, where he is pastor of the Union church of Wadsworth and Fernley, was the speaker for the annual guest day luncheon of the Tri Delta Mothers' club Wednesday at the chapter house. First of a series of activities planned for Reno High school's senior class, a Shakespearean program was presented Friday afternoon by Dr. Gareth Hughes, former star of stage and screen in England and America, now pastor of the Union church in Wadsworth. Famed as the creator of Sir J. M. Barrie's "Sentimental Tommy," Dr. Hughes held his audience spellbound with his interpretation of the balcony scene from "Romeo and Juliet." the bargain and compassion scenes from "The Merchant of Venice," and an excerpt from "Hamlet." Outstanding among the reading was Dr. Hughes' rendition of the role of Shylock, which was scholarly in its accuracy and finely drawn in its action. Motion pictures and plays in which Dr. Hughes has enacted leading roles include such well known productions as "Sentimental Tommy," "Mrs. Wiggs of the Cabbage Patch," "Little Eva Ascends," "Hamelt," "Macbeth," "Othello," "Twelfth Night," "The Merchant of Venice," and "Romeo and Juliet." Following his Shakespearean readings, Dr. Hughes exhibited his priceless collection of incunabulae and rare volumes, which are among the most valuable in the world. Notable in this exhibit were Shakespeare's Fourth Folio, published in 1680, the first quarto of "Julius Caesar," the first editions of the Holinshed's and Froissart's Chronicles, thirteenth, fourteenth and fifteenth century manuscripts, Elizabethan documents, the prayer book of Queen Elizabeth, the primer of Henry VIII, and magnificently illuminated leaves from the Books of Hours. Guests at the home of the Rev. Gareth Hughes in Wadsworth last Thursday were Miss Hedy LaMarr and Mr. Mark Stevens of Hollywood. They attended a short service of evensong at the Union Church, and were later entertained by Misses Helen Thomas and Phyllis Walsh at the S Bar S Ranch. Many persons who had gathered at the Hughes home to greet them were included in the dinner party at the ranch. The Rev. Gareth Hughes, veteran Shakesperian actor who is now minister of a church in Wadsworth, and Dr. Edward M. Hulme, distinguished professor emeritus from Stanford University, will both be on the faculty of the University of Nevada this year. The additions were announced at yesterday's meeting of the board of regents by Dr. John O. Moseley, university president, along with several other appointments. They were all given approval by the board. Mr. Hughes, who has made several appearances here and is well known to Reno audiences, will work with Edwin Semenza in teaching dramatics and directing the University's theater productions. Mr. Semenza is also director of the Reno Little Theater. He and Dr. Hughes will take over the duties performed by Prof. William Miller who resigned at the close of last semester. Dr. Hulme will lecture in history and political science, in which subject he gained wide distinction during many years on the faculty of Stanford where he was recently retired. Gareth Hughes, an ex-Broadway actor and silent screen star turned missionary, disclosed at Winnemucca yesterday that he had rejected a movie offer in favor of continuing his work among Nevada's Indians. Known as Brother David, Hughes said he had been offered the lead in the forthcoming RKO picture "Desert Padre," but had rejected the role because "my life interest is the Christian work I am doing among my beloved Indians." Nevada's famous Brother David - Gareth Hughes to the theater world - is going home to his native Wales on Wednesday. The missionary to the Indians at McDermitt, at St. Mary's Chapel at Nixon, and at the Union Church at Wadsworth will leave from the Municipal Airport at 6:15 a.m. The 64-year-old former toast of Broadway and Hollywood, said by many to be outstanding as a Shakespearian actor, who had been in Nevada since 1944 as a missionary to the Indians, has not been home for 31 years. Now an American citizen with two careers, both of which brought him much fame, Brother David will go to Llabalby, Wales, where he was born and where more than 50 years ago he won the Silver Cross of Wales as an amateur elocutionist. His brother and his cousin, author William Glynn Jones, who won the Atlantic Award a few years ago, have urged him to come home. For the past six months the missionary has been in poor health, and so last Sunday, in the Union Church of Wadsworth he preached his last sermon to the Indians, baptized an Indian baby, and bade his charges good-bye. On Friday he leaves San Francisco via the polar route for London. He will lecture on his life in Nevada, and he will be an unofficial ambassador for his adopted state, taking with him much data on Reno, "The Gateway to the 1960 Winter Olympics." As Gareth Hughes, he came to New York in 1914 with a troup of Welsh players, bringing to America a play that had scored a hit at London's Haymarket but was to prove a failure in New York. The rest of the company returned, but Hughes stayed on. He caught on as Little Benjamin in a play, "Joseph and His Brethren" starring James O'Neill, the father of Eugene O'Neill. His first big success in the United States was in "Molar" starring Holbrook Blinn, at New York's New Amsterdam Theater. Sir James Barrie picked him to play the title part in "Sentimental Tommy." Vicente Blasco Ibanez named him for the principal role in "Enemies of Women." He was a companion of Anatole France and he played with Rudolph Valentino, making more than $2,000 a week. He won recognition as one of the great stars of stage and silent screen. In the mean time he had become an American citizen. Then came the depression and his fortunes were wiped out, his home and his savings lost. All that was left he sold, with the exception of some rare works of Shakespeare and valuable early editions of the Bible, many of which he recently gave to the library at the University of Nevada. Seeking mental peace and remembering his father's advice, he turned to religion and become a postulant or novice in the Protestant Episcopal Society of St. John the Evangelist at monastery in Massachusetts. After a year there he learned that a missionary was needed on an Indian reservation in Nevada. Brother David's first post was in St. Anne's Chapel at Fort McDermitt. Soon the Chapel of St. Mary, at Nixon, was added and for some years he commuted between his two parishes. His friends of the theater did not forget him, nor did th people of Reno take long to learn of his presence, and they became contributors to his work with the Indians. Brother David will tell many stories of the kindness of the Reno merchants to him. Clothes came from the wardrobes of the Hollywood stars, and Marion Davies sent him a Cadillac, which he traded for a jeep as better suited to his work with the Indians. "Still a Ham" - Brother David will be the first to admit that though he deserted the theater, he did not leave what he had learned on the stage behind him, for he dramatized his teachings, and the Indians seemed to understand him. He gladly admits that he is a "ham," and adds that perhaps he is doing his own soul more good than he is doing the Indians, but until recently he was most happy. Great Shakespearean actor Gareth Hughes (more familiar locally as Bro. David) back from Wales and listing his address as the Motion Picture Country House and Hospital at Woodland Hills. HOLLWOOD (UPI) - Funeral services were held Wednesday for Clara Kimball Young, one of Hollywood's pioneer silent film stars. Several hundred friends attended the services at Pierce Brothers Mortuary here. The mourners included Gareth Hughes, former Indian missionary and actor who was brought to Hollywood by Miss Young in 1919 to play the juvenile lead in "The Eyes of Youth." Hughes co-officiated with Dr. Ernest Wilson of Christ Church Unity at the services. Miss Young, 70, died Saturday after lengthy confinement with a respiratory ailment. Cremation followed services Wednesday. Hollywood, Oct. 12 (UPI) - Gareth Hughes, 70, who abandoned a fabulous movie and stage career to become a missionary in the Nevada desert, has died, it was learned tonight. The death of Hughes Oct, 1 went unnoticed in the entertainment world, but it was confirmed by the Motion Picture Country Home and Hospital in suburban Woodland Hills. It was during World War II that Hughes turned his back on Hollywood that once paid him $2,000 a week. He left Hollywood for the desert to serve the Paiute Indians, to whom he was Brother David. As a young Welsh actor, Hughes career began in 1919. He played the title role in J. M. Barrie's "Sentimental Tommy" and appeared in such movies as "The Little Minister," and "Spanish Dancer". Immigrated: 1913-14, living uninterrupted in New York and Los Angeles. Description: 5'4", straight mouth, med. forehead, round chin, brown hair, blue eyes, fair complexion, medium and straight nose, oval face, two moles on left arm. Several people on this voyage were traveling care of "Hart Comedy Theatre". They included the following: Ernest Cove, Eleanor Daniels, William Hopkins, John Aldersey Howell, Richard Hopkins, Edmund, Lilian and Edmund (age 10) Kennedy, Tom, Harriett, Phylis (age 8) and Doris (age 11) Owen and Harold West. Last address: Los Angeles, U.S.A. Final Destination: Los Angeles, U.S.A.